Hi everyone – I hope all our Milo, Super 7s, Fast 9s and U16 families have had an enjoyable end to their season last weekend. I know I popped in on Sunday the last couple of weeks to see our 7s and 9s – and it was so obvious of not only the development but also the fun that was being had. Whilst at Nunawading, we are not focused on just winning, it is great when our ‘competitive teams’ do qualify for finals………. U12B – Finished undefeated on top of the ladder. Playing their semi final this Thursday and Friday at Mahoneys Reserve oval 3 (bottom oval). Coach Jean-Paul and the boys and girls have had a great season, and deserve this opportunity to play a home final. U14B – after needing to beat the top team last week to qualify, the boys won and finished third. A fantastic achievement after having a slow start to the season. They now have to play the same team again this Wednesday and Friday away at Laburnum. Girls Team – Finished top of the ladder after a great season under Chris Baensch’s coaching. The girls are really enjoying their cricket and friendship this season!. The girls play their semi final this Wednesday (tomorrow) at Mahoneys Reserve 2. Nunawading First Girls team to play a finals match!! U18 – Finished the season second on the ladder – after having some bad luck with injuries and other commitments post Christmas. On saying that, I know that Kev and the boys will be giving it a real hot crack!! The boys play this Wednesday and Friday at Bob Saker Oval. We all wish all teams the best and just as importantly, congratulate them on the achievements and season to date. If you are free, please come down and support our teams. On Friday Night, our club rooms will be open, and we will ensure there is food to eat (most likely some Piccolino Pizza). This is a fantastic achievement by all our coaches and importantly our players – well done to everyone. 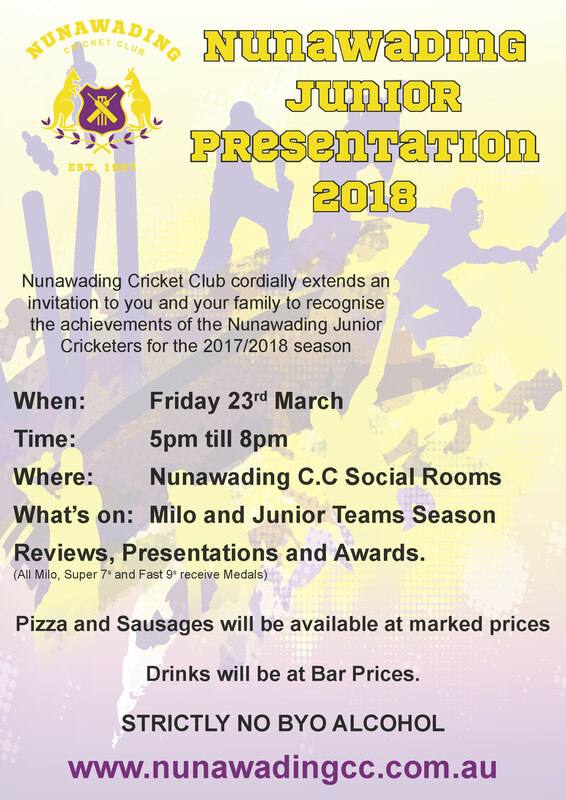 As per previous weeks, even if you are slightly interested in the 2018 Nunawading Cricket Academy, please let me know (or express your interest at our club rooms on Friday night in the sign up sheets). Club Coach Rob Ferdinands has a great program available, that supports all levels of cricket and different skills. Details attached. Please feel free to chat to Rob as well in relation to the details of the program – and how/why it will help your son/daughter. This is not Dave’s business, however CTO groups are supporters of Nunawading, and Dave can help you get in contact with CTO Group – and ensure you are looked after.